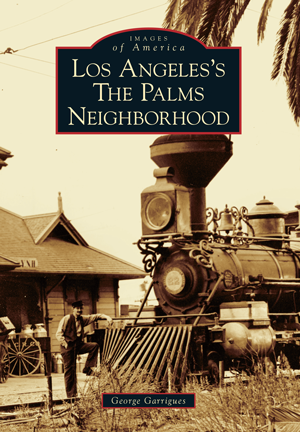 The Westside neighborhood of Palms is the oldest suburb of Los Angeles. Founded in 1886 halfway between L.A. and the beach on a steam railroad line, Palms attracted wealthy Angelinos escaping the summer's downtown heat as well as Easterners seeking a new life in "the natural home of the fig, olive, lemon, lime, apricot, and that class of fruit that brings the largest profit in the local market." Rancho Park and Mar Vista had yet to make it onto maps—it was all "The Palms." The school district stretched from the Santa Monica Mountains on the north toward Redondo Beach on the south. A lively social and business life sprang up, but gradually the metropolis enfolded Palms, which was annexed into Los Angeles in 1915. After World War II, subdivisions brought young families, the flatlands became a huge swath of apartments, and the barren hill area became the tree-shrouded Westside Village. Author George Garrigues's first job after leaving UCLA in 1953 was as a technical copy editor in Palms. He later became a newspaper reporter and retired as a university journalism professor. He was one of the founders of the Palms Neighborhood Council and is a past president. He lives in Northwest Palms (Westside Village).